« Overconfidence is my weakness. It’s finished! I grafted it together (successfully) last night, and blocked it this morning. Love your blog and its name. I think my husband needs a toy Cthulhu for his birthday…. 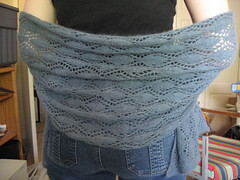 Wow – that is a VERY pretty shawl. You’ve done a lovely job with it! Congratulations on finishing! its lovely. very inspirational. and Cashmere!